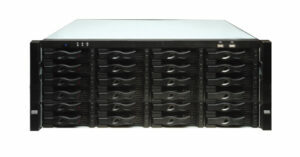 COP Security has advanced its partnership with Western Digital, using WD’s new Re hard drives in the Nexus IP NVRs. Designed to fulfil the control and recording needs of larger installations, the Nexus 128 & 256-channel IP NVRs utilise WDs Re hard drives to offer flexible and scalable high-quality recording, with storage capacities up to 64Tb and 96Tb respectively. The NVRs feature performance encompassing 1080p real-time recording, up to 8 Megapixel recording resolution and 512Mbps incoming bandwidth. For flexibility, the NVRs include one VGA output, two HDMI outputs, plus expansion spaces for video walls. Up to six screens and a front panel monitor can be deployed for multiple display operability using additional HDMI video cards. ONVIF compatibility, support of multi-brand IP cameras, a Smart Search facility and the supply of free CMS software add to the IP NVR package. The WD Re hard drives feature a high error tolerance and MTBF and have been through extensive Functional Integrity Testing (F.I.T), prior to release of the product.